MOSCOW (Sputnik) - Patriarch of Moscow and All Russia Kirill has sent a letter to Constantinople Patriarch Bartholomew, warning him that the granting of autocephaly to the non-canonical religious structure will put an end to the Ecumenical Patriarchate's primacy in the Orthodox world. "I spoke with you in private and with few witnesses about the plans of the Church of Constantinople to legalize the schism in Ukraine. Now, when these plans have been substantially implemented, possibly for the last time, I am addressing you in front of the whole Orthodox Church … [Please] step back now from communication with the schismatics and refuse to participate in the political adventure around their legalization", Patriarch Kirill said in a letter, posted on the Russian Orthodox Church's website on Monday. "If you act in accordance with the intentions set out in your letter, you will forever lose the opportunity to serve to the unity of the Holy Churches of God, and cease to be the first in the Orthodox world, which brings together hundreds of millions of believers, and the suffering inflicted by you on Orthodox Ukrainians will follow you to the Last Judgment … I pray with all my heart that this will not happen. It is not too late to stop", the patriarch added. The split took place on December 15, after a so-called unifying council was held in Kiev, where the "metropolitan" of the non-canonical church structure, Epiphany Dumenko was elected the head of the "new church." According to Ukrainian media, only two of the 90 bishops of the canonical Ukranian Orthodox Church participated in the council. 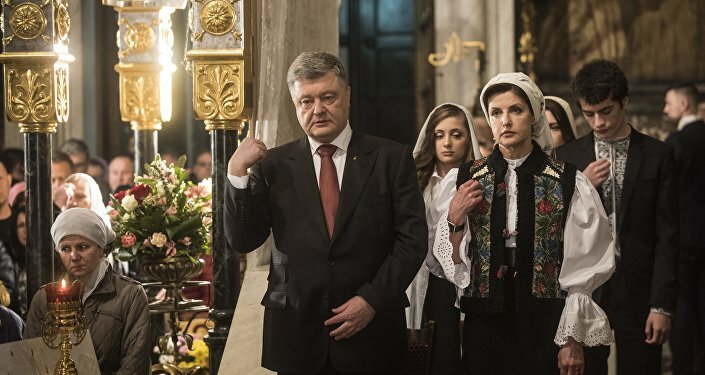 The Moscow Patriarchate stated that Kiev's actions will have catastrophic consequences and affect millions of Christians in Ukraine and other countries, and has already broken the Eucharistic communion with the Patriarchate of Constantinople.